Did you know that one in every two top manager pays money into corporate accounts via a mobile banking app? 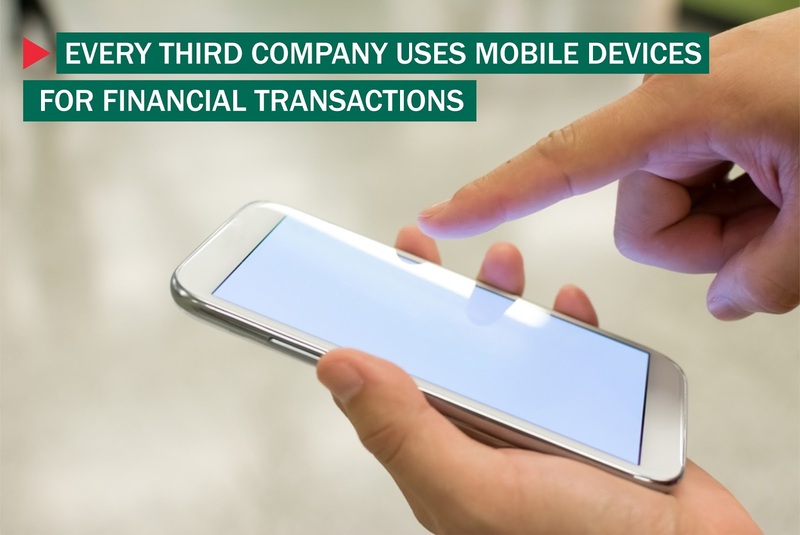 The survey found that business representatives were increasingly making financial transactions with the help of mobile devices. In particular, 28% of small and medium companies and 34% of enterprises conducted financial transactions via mobile devices. And it is not just those in financial departments (63%) but also top managers (54%) and even ordinary employees (8%) that freely make corporate financial transactions via mobile apps. The growing use of mobile devices for corporate banking could be putting company funds at risk, as mobile cyber-threats have become as mobile threats have become much more widespread in recent years and are just as dangerous to users as computer-based threats. Hackers are increasingly targeting mobile platforms. In the third quarter of 2015, Kaspersky Lab products for mobile devices detected more than 300,000 new malicious programs. Of these, the highest growth rates were demonstrated by a Trojan-Banker designed to steal credentials to Internet banking and e-payment systems, as well as credit or debit card data. The share of this type of malware increased from 0.6% (630 programs) in the second quarter to 1.5% (2500 programs) in the third quarter. "The trend shows a continual increase in mobile banking usage by corporate banking clients. This trend is certain to continue as corporate and consumer banking clients alike migrate to the convenience of mobile banking. This creates an operational imperative for banks to very carefully consider the security and fraud prevention approaches they need to take in order to adequately ensure secure mobile banking applications, protect confidential customer data, and guard high-value corporate customer transactions,” says Ross Hogan, Head of SafeMoney Business Development, Kaspersky Fraud Prevention, Kaspersky Lab. All users of mobile banking services, corporate and consumer, must also be vigilant about their own security and behavior while also questioning their bank about the measures taken to ensure their safety,” he added.